The Sheldall Schoolhouse was built in 1860 by newly immigrated Norwegian farmers from lumber harvested along the Skunk River. It was built by Lars Henryson on land in southern Hamilton County owned by Lars Sheldall. This school served many functions including an early church and was a polling location during the Lincoln presidential election of 1860. The schoolhouse was moved to its current location in 1990 by the Story City Historical Society. 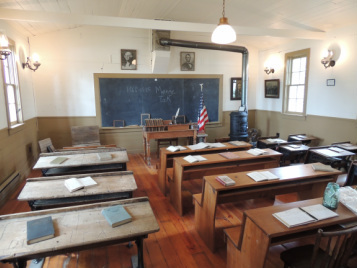 The restored building shows how education was conducted from 1860 - 1885. 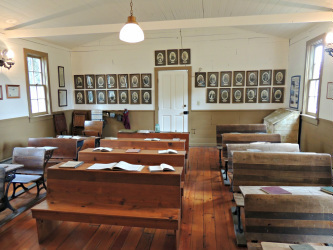 The schoolhouse is located at Broad St and Hillcrest Dr.
Across the rear interior wall are images of all the teachers who taught at the Sheldall Schoolhouse. For more information about the Sheldall Schoolhouse and the people who used it, please click the links below.